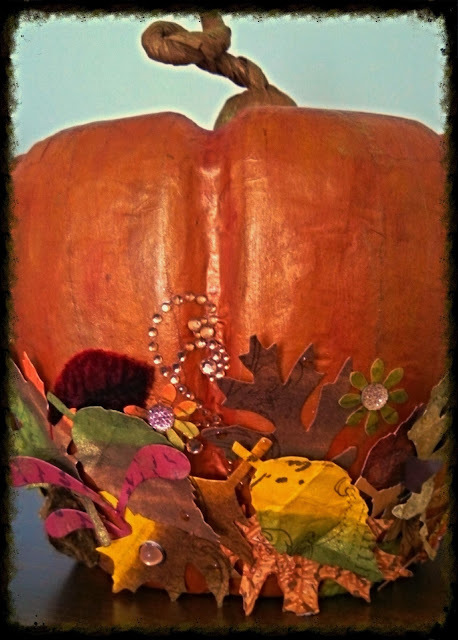 Zingala's Workshop: Fall is for pumpkins! Hi everyone! Thanks so much for stopping by today. I do appreciate it. 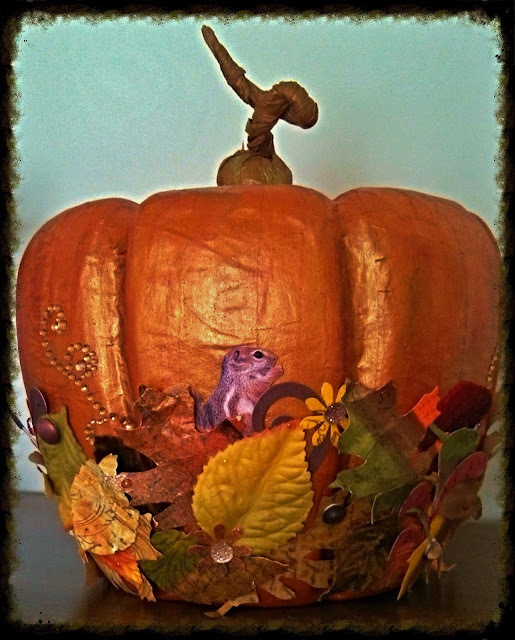 My favorite paper arts store, The Queen's Ink, in Savage Mill, Maryland had a challenge for fall. We had to create a project that had a pumpkin in it, or be a pumpkin. Patti, the owner and a good friend, has had these challenges before at Christmas time. They are really fun and people come up with some great ideas. She's working on a new challenge for this Christmas and I can't wait to see what she decides on. Anyway, here is my entry. I had a paper mache pumpkin that I wanted to decorate and when Patti sent out the word about this challenge I was ready! I inked, distressed, stamped and crumpled manila card stock and ran it through the die cut machine with the Tim Holtz tattered leaves die. I used a punch to cut little daisy flowers out of the left overs from cutting the leaves, and I gathered some paper and velvet leaves from the stash. I cut a few small flourishes with an old Sizzix die and found a card with a cute little squirrel that just had to be added to the mix. The squirrel was my husband's idea because he always calls our daughter the little red squirrel because of her red hair. Once I had gathered all my leaves and other embellishments, I went to work on the pumpkin. 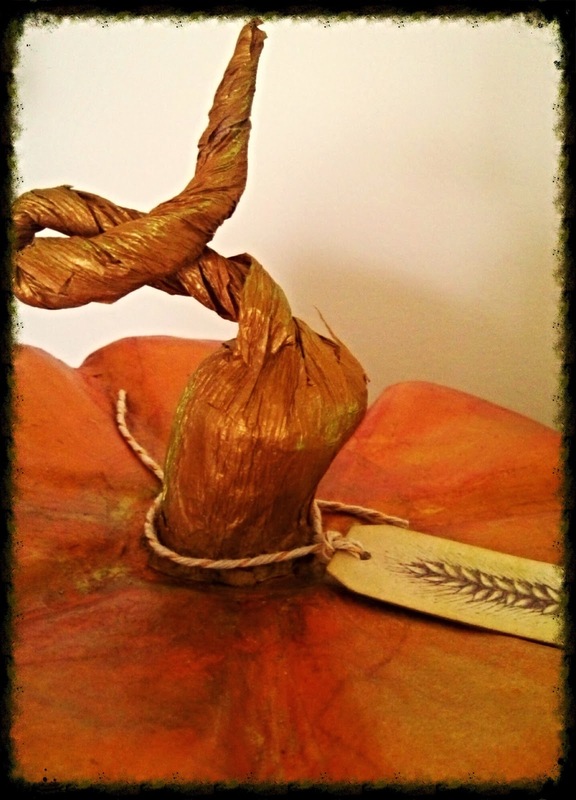 I used a coat of Ginger Peach Silks to cover the pumpkin and the added color with Spiced Pumpkin and Nutmeg. Once it was all dry I highlighted it with Gold Gilders Paste. I wrapped the stem in a crinkled tissue paper that I've had for years. It's copper color and I added some green gold metallic wax paste to highlight it. 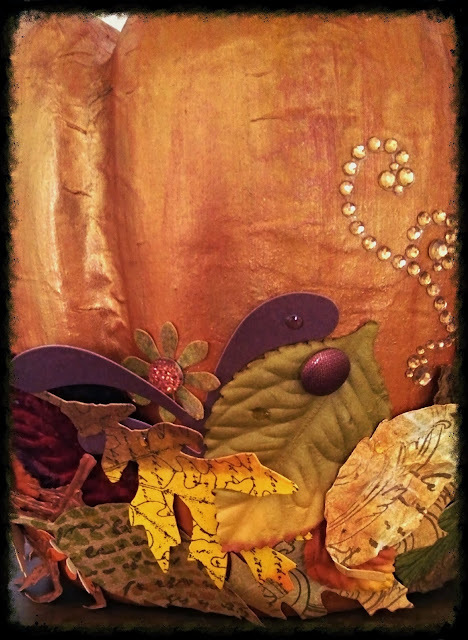 When everything was dry I started gluing on the leaves and embellishments. I had some sticky backed rhinestone flourishes that I scattered around the pumpkin and glued the leaves and paper flourishes over them. I used some sparkle sticker dots from Kaiser Craft and some other stickers to add dimension to the leaves. I was really pleased with the way this turned out. I had envisioned this for a while so I was happy that I was able to recreate what I was thinking. Here are a few details which are self-explanatory. So, that's my pumpkin with its garland of leaves! It wasn't the winner, but the winner was a fantastic Steampunk pumpkin! And, Patti, who is a very generous friend to all her customers, gave everyone who entered 10 Queen Bucks to spend in the store! They were presented in the most fabulous envelopes that Patti made out of Authentique Halloween papers. I love the envelope as much as the Queen Bucks!! Unfortunately, I haven't taken a picture of the envelope! I must do that! That Squirrel just completes the whole look!!! I like the rhinestone swirls too. Absolutely stunning Maryanne! Wow, the colour of the pumpkin is fantastic and I adore what you did with the leaves!! That little squirrel just finishes it off to perfection!! Great Fall make! This is amazing Maryanne...I am crushing on those leaves! This will make an amazing Thanksgiving Day centerpiece! Love it! Awesome pumpkin Maryanne, In my book you are a winner! I love the little squirrel, it was the right touch to add. I hope you had a good weekend, too, Maryanne! You are SOOOOOOO creative! I just love your paper mache pumpkins! It is absolutely beautiful!!!! I can't wait to see the Christmas challenge and what you come up with for it! Your pumpkin is awesome, Maryanne! But it just turns into getting real fun! Yay!